Ingrid Siliakus creates these breathtaking pieces of intricate architecture using a single sheet of paper. She carefully carves out precisely drafted architectural forms to create beautiful layered landscapes with an incredible level of detail. The work process is laborious to say the least, and Siliakus often goes through 20 to 30 prototypes before she is satisfied (it's a good thing that each one uses just one piece of paper). Following the master of this paper art form, Japanese paper architect Masahiro Chatani, Siliakus learned that the process begins with one architectural design, to which layers and layers of details are added. It was only after carefully studying the professor’s work that Siliakus learned to design these precise constructions. The Amsterdam-based artist transfers the design skills of an architect to a two-dimensional form, examining and exploring how each layer intertwines and overlaps. The work, she says, is a meditative process of cutting and folding the paper into different variations. And the result is extraordinary, a testament to what can be done with just one sheet of paper. She must have been the one doing the impressive paper cut city at the beginning of the 2011 Pet Shop Boys Ballet "The most incredible thing" in London?! It was only after carefully studying the professor's work that Siliakus learned to design these precise constructions. The Amsterdam-based artist transfers the design skills of an architect to a two-dimensional form, examining and exploring how each layer intertwines and overlaps. 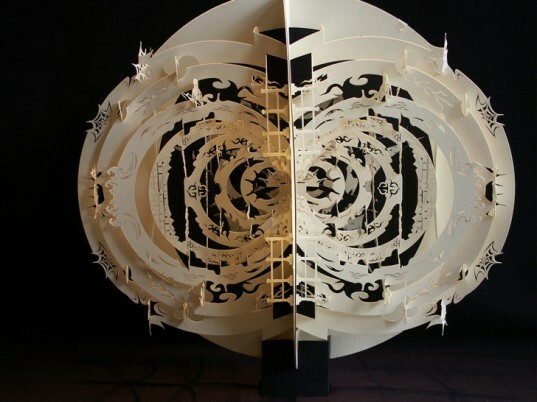 The work, she says, is a meditative process of cutting and folding the paper into different variations. And the result is extraordinary, a testament to what can be done with just one sheet of paper. An intricate cathedral made of just paper. Siliakus also makes these pop up books out of different color papers. A close up look at the cathedral. Siliakus uses negative, cut away space to create the rooftops of her buildings in this piece. A closeup look at the "Big City". One of Siliakus' even more intricate works entitled "Een ander zicht op het werk". "Cosmopolitan" is a black and white interpretation of a paper snowglobe. An accordion style piece that opens and closes like a pop up book. Siliakus' work is not limited to rectangles. 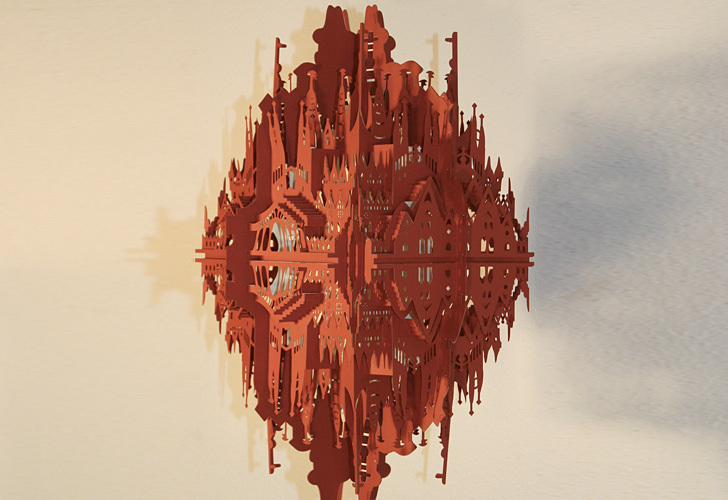 This star-shaped city is one of her latest pieces. Some of Siliakus' work is Escher-inspired. A close up look at the "Cosmopolitan."